Adding structure to your business allows you to free up wasted time and not be bogged down with administrative processes. Information and documents are easy to find with one click of the button anytime, anywhere. Stay on top of your projects and tasks and know exactly what is occurring in your business. The ability to see who is doing what in real-time or through reports allows greater efficiency, through better resource allocation and accountability. Keeping everyone on the same page is possible. Streamlining and centralizing communications makes sure that nothing slips through the cracks. It provides the comfort that critical business information or processes will be continuously available. Take collaboration to new heights with a wide range of easy to use and powerful features. Kickstart your projects with AceProject! Discover the power of online team collaboration. Enjoy a new Experience! 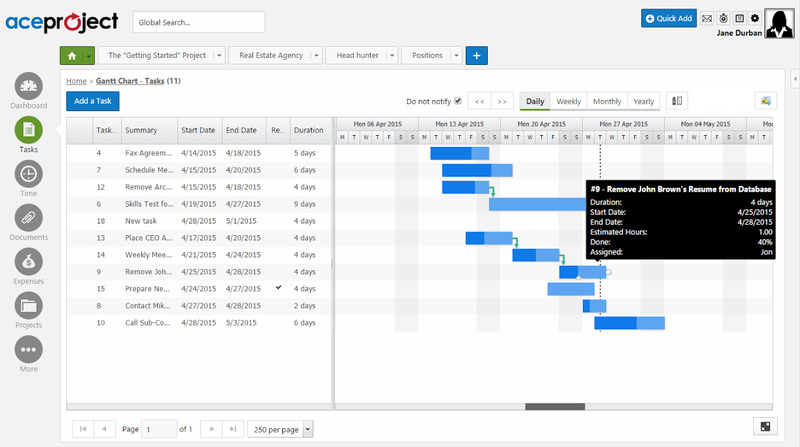 Streamline the project management process by viewing and reporting progress across your entire portfolio. 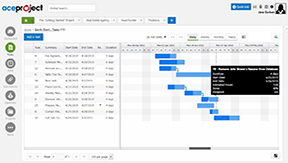 Visually track project and task progress, view deadlines and task dependencies using our interactive Gantt charts. Use templates to ensure that your organization's standards are maintained from one project to the next. Discover the MultiTasker in you! Create, assign, organize and execute tasks with ease. Time and progression are tracked through the project life-cycle. 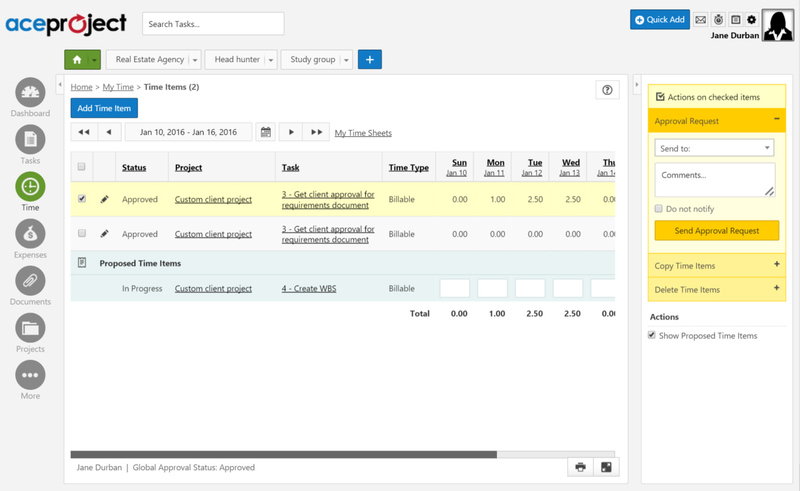 Create, assign, organize and execute tasks with ease. Time and progression are tracked through the project life-cycle. Easily setup recurring tasks on a defined time-frame to take away the burden of creating and editing tasks that repeat on regular schedules. Create your reports and views based on selected criteria. Define your fields, filters, and sorting order then save your report for future use. Streamlines the time tracking and approval process Punch in and out while working on a specific project or task. The time elapsed is auto-recorded in the user’s timesheet. Punch in and out while working on a specific task. The time elapsed is auto-recorded in the user's timesheet. Fill out timesheets and submit them for approval. Once approved, time entries cannot be edited, for better control. 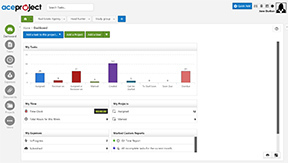 Generate advanced time reports based on numerous criteria and filters to quantify time usage across your organization. Store all of your documents in the cloud Sometimes paper flies away, but with AceProject you can upload documents and share them with your team. Store and share documents online. Upload and attach them to projects and tasks individually or in bulk. Keep a history of document changes. Track and access all iterations made to a specific document. Lock a document to leave the original copy intact. Prevent other users from editing or deleting a specific document. Don't let your expenses overgrow... Record expenses against projects and tasks and submit them for approval. Stay on budget by tracking every project's cost. Record expenses against projects and tasks. Attach supporting documents related to each expense. Submitted expenses are approved or rejected by your project manager. 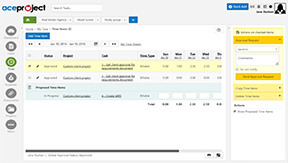 Keep expenses under control for better budget management. 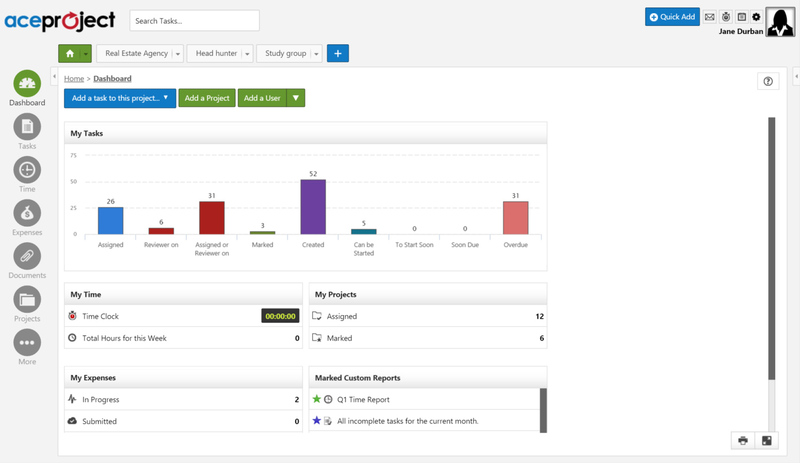 Generate advanced expense reports based on numerous criteria and filters. Keep an eye on your project costs. AceProject is proud to offer a fully featured solution to quickly familiarize your team to an online tool at no-cost or obligation. Yes, it’s FREE! The ideal choice for small organizations and teams that want to harness the power of collaboration and become more productive. Perfect for mid-sized businesses or teams that need to support a higher number of users and projects. Need even more projects and storage to manage your organization? This package provides the flexibility you require. Independant of your size, this package is the best choice to organize, track and collaborate without the hassle of limitations. Go for Gold! For businesses aspiring to get and stay organized, AceProject looks like the best card in the deck. 50+countries the world is using AceProject! Why thousands of people trust AceProject? For over 14 years, AceProject has been delivering a high quality product with strong features, allowing all organizations to improve their productivity and efficiency through online collaboration. Countless projects have been completed by our growing user community dispersed throughout more than 50 countries. They have experienced continual improvements with uninterrupted service within a secure environment, explaining our high satisfaction rate. AceProject offers a free fully-enabled basic package, with fewer privileges than paid packages with regards to the number of users, projects, tasks and amount of storage space. Offering this package has been the key to establishing our initial trust. It sometimes takes a little time, and not a trial end-date, to decide. Our customer support staff provides a high level of responsive support. Contact us through email, chat online, or by phone. It is always a pleasure to interact with our users and hear what you have to say, explain a new feature, and better understand your usage of AceProject. With thousands of users everyday, AceProject is dedicated to continually improve and enhance functionality and user experience. This is done through constant communication with our users and feedback via email, online chat, and social media channels. All feedback is collected and consolidated and has a major impact on our product orientation. Smartphone applications, streamlined timesheet management, and countless improvements have been made possible through user feedback. Updates are frequent allowing new features and enhancements to seamlessly become available for use. Thank you for being a big part of making AceProject one of the leading online project tracking software.